ABCOMRENTS introduces you to the Transparent HYPEBOX®. 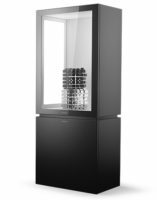 Available in standard or fully interactive, this transparent interactive box will WOW your audience by allowing you to both display your product inside of the box while playing digital content on the front of it! use double quotes for specific results. ex: "video walls"